1) Korean language included. it can be selected with "/KR" parameter when it lunch from OS. 2) Can be stop encoding when it on processing. 3) Fixed abnormal exiting program when it pressed X icon (quit) on title window. 1) Download program and extract ZIP to your favor folder. 2) If you already have previous version , just overwrite there. 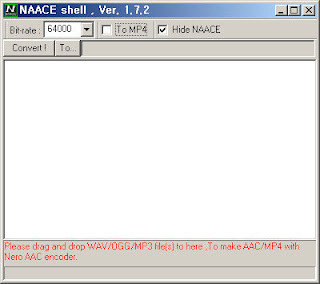 4) Drag MP3/OGG/WAV files to NAACESHL from Windows explorer. 5) Adjust some options (if you want) and press "Convert!" button. This program is for freeware.It dosen't matter on using as freeware. but you have mind for commercial , I can't accept that.Because some external programs (BASS.DLL and NeroAACe.EXE) are not allowed for using in commercial. You can redistribute this program as freeware. Please keep original ZIP file.